After 13 years, Wizards has finally released another Un-set. And boy, does it deliver! Where Unglued and Unhinged were collections of far out ideas, Unstable is a proper modern Magic set that was developed to be played with rather than just looked at. But make no mistake, it is still really an Un-set. If you like your rules tidy and your audience behind a rope, Unstable is definitely not for you. There is a lot of whackiness to explore, and that’s what we’ll do in this article. However, I will not be making this a normal set review, as I don’t think the audience for Un-cards in regular Battle Boxes is big enough for that to be interesting. What is interesting is talking you through how I designed the Unstable Mini Battle Box. I’ll explain my considerations, and hopefully you’ll learn something useful. And I think that, even if Un-sets are normally not your cup of tea, the Unstable Battle Box is something everyone should give a whirl. This card sparked endless debates, discussions, musings and whispers throughout the internet. So much so that I suspect the only reason Mark Rosewater was allowed to go ahead with this project was so Wizards could finally end the contraption debate for good. Better yet, knowing what we know about Mark, I wouldn’t be suprised if he planted the Boss in Future Sight just so he could make another Un-set ten years later. It’s how he rolls. I absolutely love what they did with contraptions. This is no half-hearted attempt to come up with something that kind of works. This is taking a successful joke and turning it into a full-on standup comedy routine. Not only can our riggers now assemble contraptions, they can put them into sprockets and crank them every three turns. That is over-the-top hilarious game design, if you want my opinion. 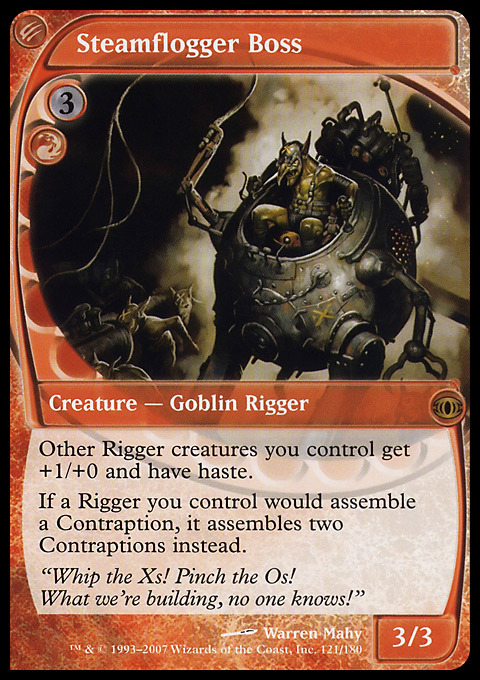 Clearly, if I’m going to design an Unstable battle box, it will need a contraption deck and riggers. Constrictions also work like dominoes at times. As soon as I decided to make a 28 card contraption deck (yes, I really wanted to hit the contraption note hard with this box), this meant I had to have enough cards to put contraptions into play. Now, this was a little hard to judge without playtesting, because many of the cards that can assemble contraptions can do so only with considerable restrictions. On the other hand, there are also cards that can assemble multiple contraptions in a single turn. In the end, I decided not to overload the box with contraption enablers. Partly for fear of running out of contraptions, and partly because it could make the box feel too one-sided. Still, you’ll see there are plenty of Contraption assemblers in there. The other theme that’s been hit pretty hard are the combined creatures. I couldn’t resist to put in Grusilda, Monster Masher (if only for getting to hum “Monster Mash” every time I play her). But the real meat of this theme are the host creatures and augment creatures. This is quite a parasitic theme, and the only way it will work is if the critical mass of cards is large enough. In the end, I settled on 13 host creatures and 10 augment cards. This should give you a decent chance of drawing 2-3 host cards and 1-2 augment cards during the first ten turns of a game. I felt that any more would be pushing the theme too hard. In fact, 23 cards was already a stretch, and I had to dip into some pretty “meh” cards to get there. On the other hand, the random combinations will greatly increase the replay factor of the Box, even if the individual cards are less than overwhelming. With 11 spots for contraption enablers, 12 additional spots for host creatures and 10 for augment creatures, I had already filled 33 of my 70 spots. This meant some other Unstable themes would have to end up on the cutting room floor. I decided to leave out the killbots, as these would also need a critical mass, and it seemed unfeasible. I also left out all the cards that let you involve players from outside the game. That leads to cool situations when used at your local game store, but I think my wife would soon get fed up with looking at someone’s cards or high-fiving someone every time I host a game at my house. I decided to run with the 6-sided dice theme and fill the rest of the Box with cool card concepts that do not necessarily fit a theme, but enhance the play experience. As a tribute to older, less fleshed out Un-sets, I also included an Unglued and an Unhinged tribute card. I hope that gave you a glimpse into my process for constructing these Mini Battle Boxes. This time, I decided to include all the mythic rares I thought were fun. As a result, the power level of the box will be more volatile than usual, but I think the point of Un-sets is not balance but whackiness. Unfortunately, it could also mean the Box will be more expensive than usual. If you feel like building the Box and don’t mind waiting, I would postpone getting the cards until the end of January. The Commander Rules Committee has decided to make all Un-cards legal until January 15, which means the better cards will be sought after until then. After that, things should quiet down a little. You can save a further $40+ if you just go with regular basic lands instead off the Unstable full art basics. That just leaves giving you the list and saying goodbye. As always, I’m curious to hear your thoughts in the comments.